The Cyodrake's Gaze is one of Neopia's most mysterious boats, and now it's lost in a sea of tiles! Fortunately, crew members can point you towards finding the ship. Locate the Cyodrake's Gaze and you win! 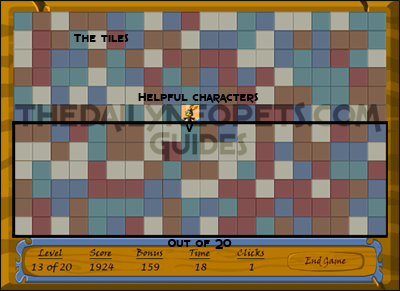 You use your left mouse button to click on the tiles on screen. The tile you click on reveals an image underneath it. These will usually point towards the Cyodrake's Gaze whereabouts. Your goal is to locate the Cyodrake's Gaze as quickly as possible with as few clicks as possible. There are 240 tiles on the screen, but you don't have to worry about all of them. As you click, you will be able to narrow down where the Cyodrake's Gaze will be. In the example below, the boxed area shows where the ship could be located. Clicking more tiles will help you narrow down this area even more. These are the tiles you really want to get. They point you towards the Cyodrake's Gaze's whereabouts on the grid. Bonju, Linae, Shumi and Hoban will point left, up, right or down to help you find the mysterious ship. This is the tile you are searching for! The cannon explodes adjacent squares (so the crew members can't point you towards the ship). The whirlpool reveals the adjacent tiles for a couple of seconds (which saves you clicks). The treasure chest gives you more bonus points. Eye of the Storm has two point-scoring modes: Normal and Time Trial. (Zen mode will award points, but you cannot send your score.) In Normal mode, you need to complete 20 levels within 20 seconds each. In Time Trial mode, you have 200 seconds to complete as many levels as you can. One strategy is to click the tile the last crew member pointed at. By doing this, eventually you will find the ship, and it's a pretty quick method because you don't need to think much before deciding where to click. If you want to make that strategy even faster, you can click every other tile in the path. So, if you see Hoban pointing up, instead of clicking on the tile directly above him, leave one tile un-clicked and click the second tile. When you find a tile that points you back the way you came, then you can backtrack and you should be able to find the ship very quickly. This can potentially cut your number of clicks in half from the previous method, and still minimizes thinking time. Another method is a more mathematical approach to narrow the board by half. Keep a mental image of the box in which the Cyodrake's Gaze could be. Head whatever direction the last crew member was pointing, and click halfway along the box. You will save on clicks, but you will spend more time thinking. Try not to randomly click. It's a waste of clicks. For whatever reason, the ship is often hidden under a tile that has a darker left and top border. You may want to try to click on tiles with a darker border first to increase your guessing performances. Also, when you start your game, make sure your option is set to "Brief View" instead of "Extended View," since you earn more points on that setting. If you're trying for a trophy, it's usually best to play in Time Trial mode. The best opportunity for earning points is your click bonus, so you can maximize this bonus by maximizing the number of levels you can play, and Time Trial does not limit the levels to 20. Eye of the Storm is based on the mini-plot The Cyodrake's Gaze, which occurred in 2006. Eye of the Storm is a simple game that doesn't require much thought or effort at all. It gives good Neopoints, too! Well worth the time to play it. Go find the Cyodrake's Gaze!